Learn how TEN habits can help children to understand and manage their emotions and behaviour - the NEW book from the creator of the chimp management mind model and author of the million copy selling The Chimp Paradox. 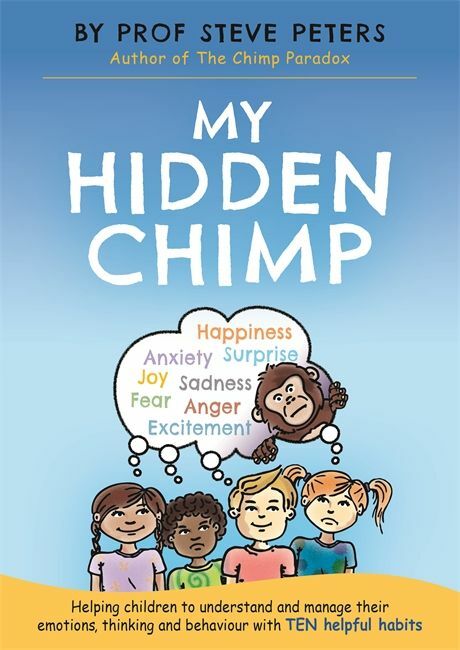 My Hidden Chimp is an effective and powerful new educational book that offers parents, teachers and carers some ideas and thoughts on how to help children to develop healthy habits for life. The science behind the habits is discussed in a practical way with exercises and activities to help children think the habits through and start putting them into practice. The neuroscience of the mind is simplified for children to understand and then use to their advantage. Written as a companion to The Silent Guides, these two interconnected books tackle how we can best manage our mind from childhood and into adulthood. Professor Steve Peters explains neuroscience in a straightforward and intuitive way - offering up 10 simple habits that we as adults and children should have in our arsenal to deal with everyday life. By also explaining the developing 'chimp' brain in children, he shows us how 10 habits can help children to understand and manage their emotions and behaviour. These 10 habits should and can be retained for life. This is an important and another groundbreaking new book from the bestselling author of The Chimp Paradox and the creator of the chimp management mind model.